Residential and commercial chain-link fencing, privacy fencing, aluminum fencing, vinyl fencing, picket fencing installations and all types of fence repairs. Since 1988 Exterior Fence Builders, Inc. Mission has been to make sure that because you allowed us to serve you that; Your fence should provide more than just security or privacy. It should add value. Fences built by Exterior Fence Builders are impossible to beat in terms of Quality, Durability, and of course value. The result is performance, beauty, and a long lasting investment that can add to the equity of your home or Business. Selecting Exterior Fence Builders, Inc. as your fence company gets you an Excellent Value and The Best in Customer Services around. 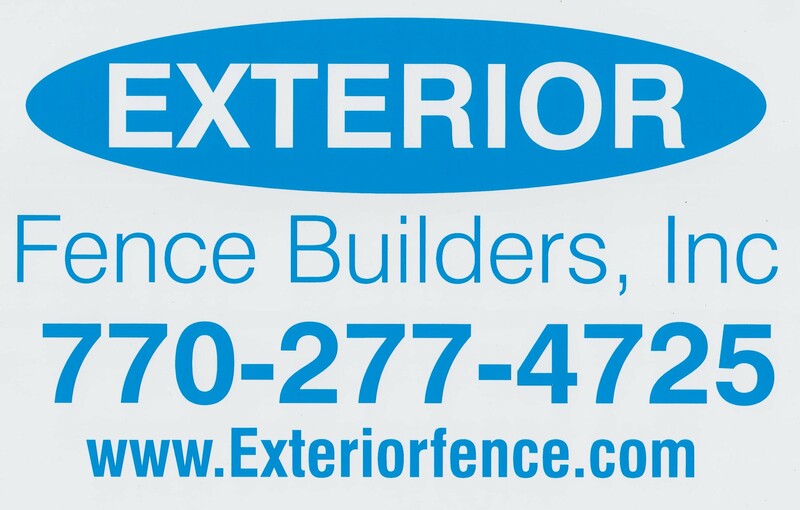 Exterior Fence Builders Inc. is the only Fencing Company in Atlanta Georgia that has a Customer-centric way of doing business. You may ask, what is a Customer-centric way of doing business? Customer-centric is a way that provides a positive experience before and after the sale and installation of your fence; it drives repeat business, and customer loyalty. "Quote I love the simplicity with the branding of exteriorfence.com." We just keep it simple! 1.) Craftsmanship: Our Installers have an average of more than 30 years of experience. we know fence installations. 2.) Product: We use only the best grades of materials, which carry an extended manufacturer warranty. 3.) Nails and Fasteners: Aluminum grip tight nails are used where appropriate to avoid black streaks and boards loosening. 4.) Gate Hardware: Heavy-duty steel hinges and latches are used throughout. All gates are designed to resist sagging. 5.) Insurance: Exterior Fence Builders is fully insured for your protection. 6.) Warranty: 5 Year Labor Warranty and 20 years materials warranty on every Ornamental and Chain link fence we sell and install. note! Wood fences are a natural material and cannot be warranted for 20 Years. 7.) Reputation: Exterior Fence Builders installs hundreds of Residential and Commercial Fencing each year, 75% of our sales are referrals by satisfied. (repeat) customers. 8.) Exterior Fence Builders is in good standing with the Better Business Bureau. Exterior Fence Builders serves our customers by providing an excellent product and an acceptable price. Exterior Fence Builders sales and installs all types of residential and commercial fencing with chain link fencing, ornamental fencing, wood fencing, PVC fencing, iron fencing, temporary fencing, construction fencing, access control as well as all type fencing repairs, with the option of emergency gates and fence repairs when needed. “Exterior Fence Builders, Will with the proper planning, install your fence at YOUR NEW HOME! ON THE DAY of your closing”. "Congratulation!" Our staffers are very familiar with The Georgia Real Estate Commission laws, and rules and regulations. We are looking forward to serving you! Have a nice day! Call 770 277 4725 for your free no obligation fence quote or request a quote online from one of the Top 10 fence companie in gwinnett to do business with that also happens to be Trusted by Dale Cardwell, The Consumer Investigator guy!